They lost to Air Force the other night. I’m talking about the Lady Rebels. The Air Force women’s basketball team is to the Mountain West what the Washington Generals were to the Globetrotters, except the Falcons women don’t fall for the confetti-in-the-water-pail trick. Because the Air Force women – like the Air Force men – are intelligent, with massive doses of character and other wonderful traits. But before the Lady Rebels had arrived tossing icicles at the baskets, Air Force had won only once – against Cal State Bakersfield. It had lost 13. It had lost to Northern Colorado and Longwood and North Dakota and Utah Valley. Last year, Air Force was 6-24. The year before that, 9-22. The year before that, 3-27. The year before that, 4-26. It must be difficult to recruit young women who are willing to get down and give you 20 pushups as well as knock down the open jump shot. But the Lady Rebels lost to this bunch, 81-69, at the academy. As you might imagine, they wanted to get out of there as fast as they could. But they couldn’t, because it was like 1 degree outside, and the locks on the Lady Rebels’ bus had frozen. Some airmen first class, or at least a maintenance crew with a blowtorch, had to come before the Lady Rebels could hightail it out of the Springs. So it had not been a good week for the Lady Rebels. And yet when I walked into coach Kathy Olivier’s office Tuesday, she greeted me with the highest of fives, because she’s a high-five kind of person – optimistic to a fault, and that’s a good fault to have when you’re 5-12. 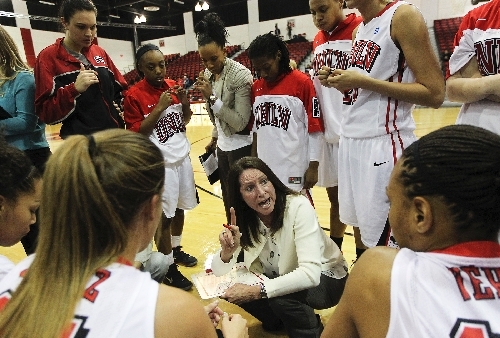 Last season, Kathy Olivier coached the Lady Rebels to 22 victories against 10 losses. It was the first time since 2003-04 the Lady Rebels had won 20 games, and after the team returned home from the Women’s National Invitation Tournament, she received a contract extension. A corner had been turned, or so it seemed. And Olivier insists a corner has been turned. But who knew Air Force would be standing on the next corner? Well, maybe she didn’t foresee that it would be Air Force standing on the next corner. But she thought some of these other teams the Lady Rebels have been losing to would be standing there, with muscles flexed, protecting turf, because a lot of these teams have senior leadership, which is what UNLV had last season. Last season, four seniors were in the rotation; this year, there is one. Having seniors is important in women’s basketball because almost everybody has them, because young women usually don’t jump to the WNBA, and they usually don’t get into fistfights in bars like young men who can shoot and rebound sometimes do. And so they usually don’t get kicked off the team. But because recruiting sometimes is difficult when you’re not winning 22 games, the Lady Rebels were young from the start. And then they lost their skilled junior point guard, Mia Bell of Durango High School, before the season started to a knee injury. And if you don’t think it’s difficult to succeed without a skilled point guard, then you haven’t been paying attention to what the UNLV men have been doing. The Rebels almost lost to Air Force, too. “I felt like we would take a few steps backward, but only because we are young,” said Olivier, 65-78 in her fifth year at UNLV. When she said this, she had me lean across the table and lowered her voice, as if she didn’t want anybody else to hear, because there might be graduate assistants or injured point guards in the next office. I was the one who pointed out that whereas last year, when the Mountain West was ranked 23rd in the Ratings Percentage Index, which is awful, this year it is 16th, which is better. Olivier raised her eyebrow, as if she wasn’t aware of this. As if maybe she would throw that in there, along with the youth and the injury to her point guard and the frozen locks on the bus at Air Force the next time somebody asked what was wrong with the Lady Rebels, after they had appeared to turn the corner. As I was leaving, the optimistic Kathy Olivier said she liked my red suede retro Pumas. She optimistically slapped my palm again and, she said, with the greatest of optimism, that she thought her team might play better Wednesday night against San Diego State at Cox Pavilion. For a little while, the Lady Rebels did. But the team that played four seniors beat the team that played one, 74-60, and that’s the way it is in women’s hoops sometimes.